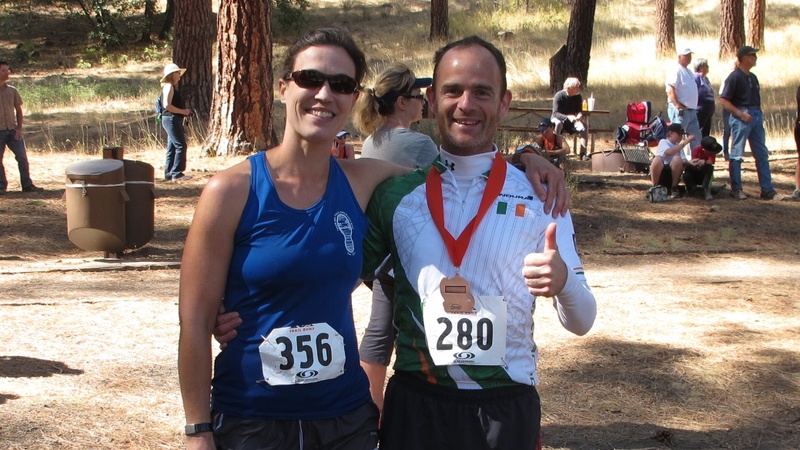 The Bizz Johnson Trail Marathon in Susanville, California, is a fabulous course that combines some of the best features of road and trail racing. This point-to-point gravity-fed marathon is run almost entirely on the Bizz Johnson rails-to-trails path, with the finish at the Hobo Camp picnic area. I consider this to be a local Tahoe race, as Susanville is just 2 hours north of Truckee. This report will cover the features of the race, then, for those who wish to read on, I will describe my day on the trail yesterday. The race weekend includes a number of running events on the Bizz Johnson Trail. Distances include: 50k, Marathon, two separate Half Marathons, and a 10k. The Express Half Marathon, like the full Marathon and 50k, is a point-to-point gravity-fed course. This Express Half is the only event run on Saturday, and all other races are run on Sunday. The Sunday Half Marathon and 10k are both out-and-back courses (i.e. up-and-back-down). The 50k is a new addition this year, and will probably be one of the fastest 50k courses around. The Express Half Marathon is a special race to me – it was my first race when I began running in 2008, and I have returned to the Bizz Johnson Trail with good results every year since. This is the first year that the full Marathon has fit my race schedule. 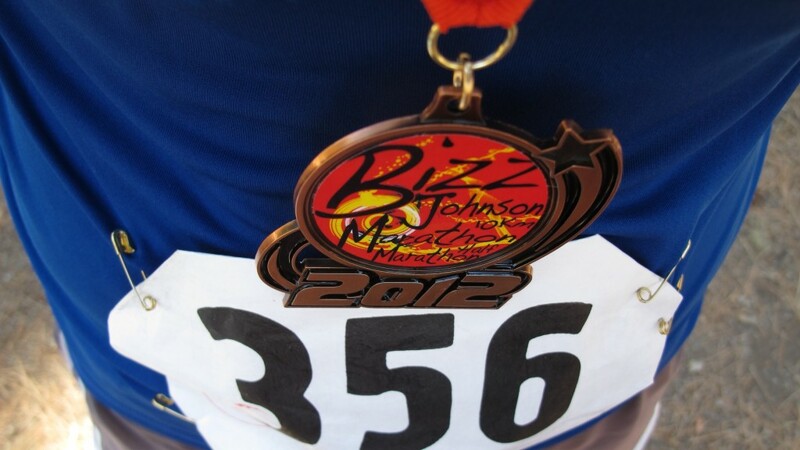 As I hinted above, the Bizz Johnson Trail runs like a road race. A former railroad bed, the trail is wide and smooth, with virtually no grades greater than 2%. There is one very short detour from the railroad bed where the course drops steeply downhill and back up. Each of the point-to-point courses starts with a relatively short up-and-back to get the distances to the finish just right at the common finish line. The full marathon is a USAT&F certified course and fast finishes can be used as Boston Qualifying (BQ) times. The trail surface is so smooth that I usually run it in my road racing flats with absolutely no traction. (Although I would be cautious with this approach if the weather calls for wet or freezing conditions.) Much of the trail runs along the Susan River, and takes you over a couple of bridges and then through two spooky train tunnels toward the bottom of the course. The first tunnel is short and adequate sunlight flows in from the far end. The second tunnel is about 800 feet long and lit with lanterns – runners should remember to take off their sunglasses! The race website has excellent maps, course descriptions, and elevation profiles. As with most trail races, the scenery is simply lovely. With the small field (about 200 in the full marathon), it can also be a little lonely. Spectators along the course are limited to a few motivated family members. Well-stocked aid stations are every three miles, so most runners will do well to carry some fluids with them. The good news is that there are infinite port-a-pines along the route! Despite a much slower time (4:01) than I was originally expecting, I still finished with a huge smile and managed to truly enjoy most of my day on the trail. In fact, it was a break-through race in terms of my relationship with marathon running. I had a pacing plan that accounted for the slight uphill the first quarter of the course, then picking up for the 20-mile “downhill” section to finish with a BQ time of 3:45. Things did not go according to plan! I’m not sure exactly why I was unable to keep up the speed, but I could tell by about mile 12 that it wasn’t going to happen. After a couple of short walk breaks followed by good, but short-lived surges, I decided not to beat myself up. And this is when I choose to change my relationship with 26.2. I have decided that I am a 4-hour marathon runner – sometimes a little faster (my PR is 3:53 at CIM last year) – sometimes a little slower. If I can’t run a BQ time on a fast downhill course in good weather conditions, then it is probably just not in the cards for me. I am done running marathons for time and pinning my enjoyment of the day to a finish time or place. When I think about my best (i.e. most enjoyable) long runs over the past year, it is not my marathon PR at CIM that comes to mind. 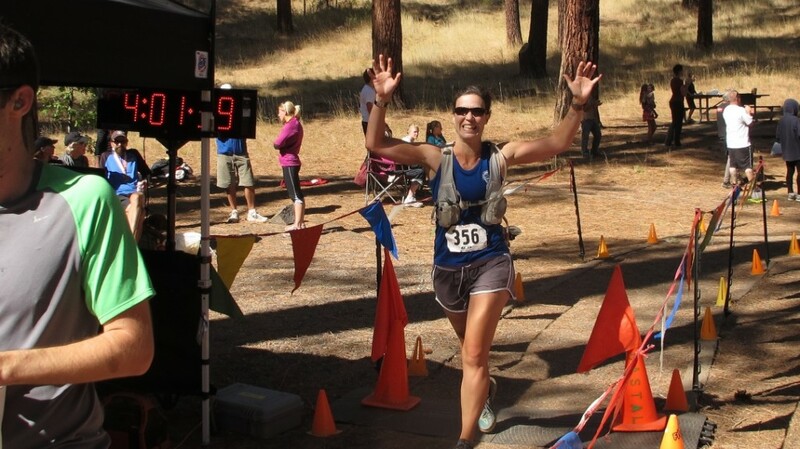 Instead, I recall the day that I spent at the Vernonia Marathon with my husband and the wonderful company at the Tahoe Rim Trail (TRT) training run in June. To that end, I must thank the “Irish cyclist” who kept me entertained on the trail yesterday. Early in the run I spotted his fast cadence and noticed he was wearing a bike jersey with “Ireland” printed across the back. I jokingly asked him if he was an Irish cyclist… turns out he is. Cathal and I ran together for various portions of the course until his calf seemed to get the better of him around mile 20. I truly appreciated the distraction. I also appreciate the gal in the pink tank top who gave some encouraging words as she passed me (I was walking) about a mile from the finish. Turns out that I’m at least still competitive enough to recognize when someone in my age group might pass me. I hustled along and ran to the finish. Now I am looking forward to a few more great trail runs around Tahoe before the snow flies. Congratulations! Every run is itself. If you were smiling at the finish and walked away, it was a good run. At least, that is my low bar for a good run. Looks like you had a beautiful day! Hope to be there next October. Helen, not sure if our son Cathal will enjoy being termed a ‘distraction’. Still you both seemed to enjoy the run,in clear blue sky ,warm weather. This may sound naff, but I really enjoyed your descriptive blog,and command of English. Lovely to read. Thanks for reading and for leaving the kind note. I will clarify that your son was a distraction of the pleasant sort.